I bought it on a lark, reading the plant tag that said "annual" thinking it was a frivolous purchase but couldn't resist the deep scarlet brilliance no matter how temporary it would be. That was years ago... so many years ago I've forgotten how long it's been. In the same terra cotta pot, it comes back every year. After the chill of winter has left, the stems begin to emerge and then the brazen scarlet petals of each bloom unfold in unabashed majesty. 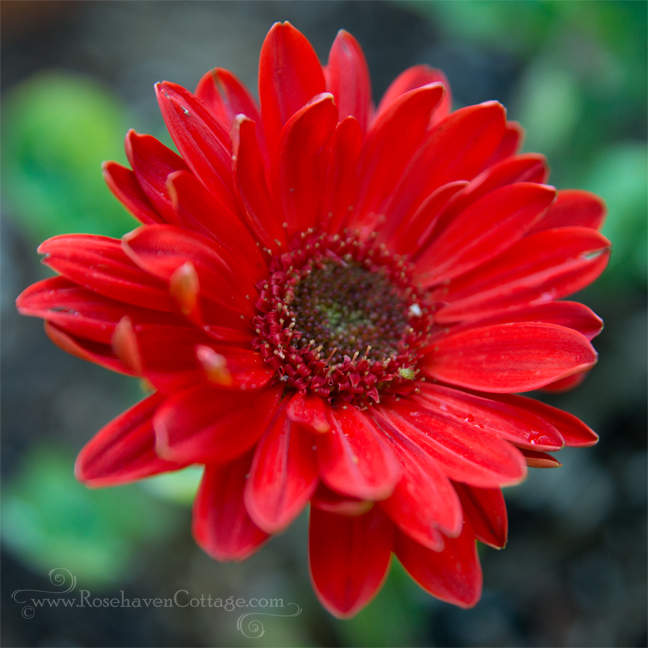 Unashamed yet unassuming, the gerbera is an every day flower with the simplicity of a kindergartener's drawing (the quintessential garden bloom) yet with a flare that says, "I am no wallflower". Years of living with its feet in the same pot, the gerbera ate away much of the original soil. Last fall, I lifted it gently and added more soil hoping not to disturb the magical spell that kept it coming back years past its original "annual" label suggested it should. As the fall days grew cooler, the leaves dried, withered and died. It looked as if I had in fact broken the spell. But just to prove me wrong (like many things in my garden) when the days grew warmer, the gerbera started showing signs of life. The emerging stems came first before any leaves. By late March, the first ruby petals were unfurling. The spell was not broken. How magnificent! The flower is spectacular and your photos show how beautiful. You are right ... it is no wallflower! Oh my goodness, that's a beauty. And you have captured it's glow so beautifully. That IS a stunning colour! So rich and decadent. I'm not at all surprised that it comes back year after year, after all I've come to know about your garden. What flower wouldn't want to live the rest of its days out there? Lovely seems not the right word to describe this wonderful flower..
How beautiful! 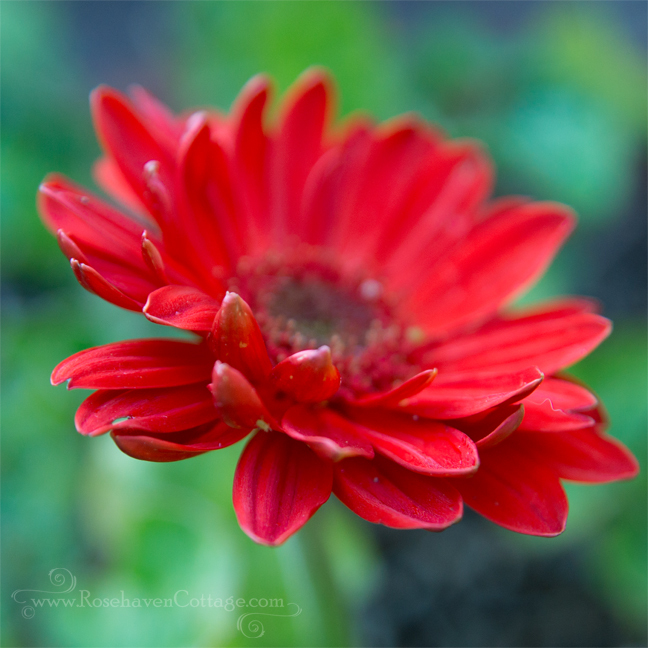 I love gerbera daisies, sadly, I never have much luck with them. So beautiful. I have to say that they are right at the top of my list with petunias in the annual category! I DO plant them every year and just can be without them.